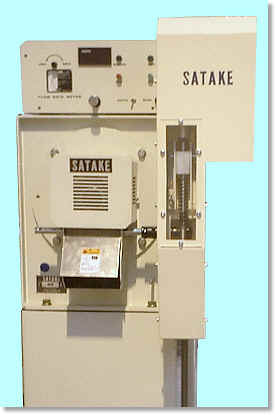 The Satake KB Polishing Machine has been specially developed to meet rice millers demands for better rice, better in appearance, quality and storability. Ordinary rice whitening machines damage the surface of milled rice. Through application of humidity controlled air during the whitening process and the new technology developed by Satake, these surface damages are cured and corrected. The KB Polisher is also available with an automated discharge gate for computer control of the milling pressures within the machine. The surface of the milled rice is smooth and clean. Creating a better looking and feeling rice gives the miller advantages over his competitors, especially when rice is presented to consumers in clear packaging. The milled rice can be stored longer because the surface of the grain is smooth and there are less grooves or dimples where rice bran, dust, fungi, etc. can stay and grow. 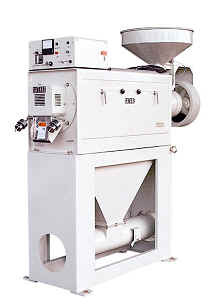 The KB machines can be used in series to create a 'silky polished' rice. Because the machine removes adhering bran and fine powder and produces very clean milled rice, bran accumulation in the milled rice passage through the rice grader, colour sorter, rotary sifter, etc is much less. This prevents the lowering of performance of these machines. Cleaning frequency is greatly reduced.